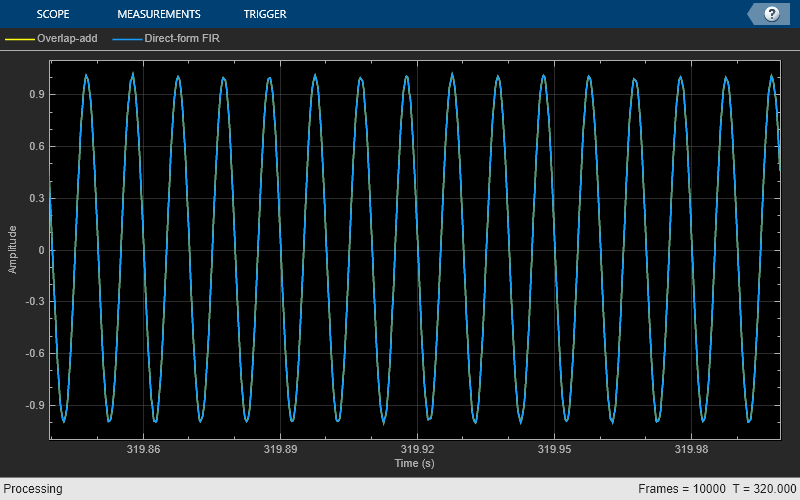 The dsp.FrequencyDomainFIRFilter System object™ implements frequency-domain, fast Fourier transform (FFT)-based filtering to filter a streaming input signal. In the time domain, the filtering operation involves a convolution between the input and the impulse response of the finite impulse response (FIR) filter. In the frequency domain, the filtering operation involves the multiplication of the Fourier transform of the input and the Fourier transform of the impulse response. The frequency-domain filtering is efficient when the impulse response is very long. You can specify the filter coefficients directly in the frequency domain by setting NumeratorDomain to 'Frequency'. This object uses the overlap-save and overlap-add methods to perform the frequency-domain filtering. For filters with a long impulse response length, the latency inherent to these two methods can be significant. To mitigate this latency, the dsp.FrequencyDomainFIRFilter object partitions the impulse response into shorter blocks and implements the overlap-save and overlap-add methods on these shorter blocks. To partition the impulse response, set the PartitionForReducedLatency property to true. For more details on these two methods and on reducing latency through impulse response partitioning, see Algorithms. Create the dsp.FrequencyDomainFIRFilter object and set its properties. fdf = dsp.FrequencyDomainFIRFilter creates a frequency domain FIR filter System object that filters each channel of the input signal independently over time in the frequency domain using the overlap-save or overlap-add method. fdf = dsp.FrequencyDomainFIRFilter(num) creates a frequency domain FIR filter object with the Numerator property set to num. fdf = dsp.FrequencyDomainFIRFilter(Name,Value) creates a frequency domain FIR filter System object with each specified property set to the specified value. Enclose each property name in single quotes. You can use this syntax with any previous input argument combinations. Frequency-domain filter method, specified as either 'Overlap-save' or 'Overlap-add'. For more details on these two methods, see Algorithms. 'Time' –– Specify the time-domain filter numerator in the Numerator property. 'Frequency' –– Specify the filter's frequency response in the FrequencyResponse property. This property applies when NumeratorDomain is set to 'Time'. Frequency response of the filter, specified as a row vector or a matrix. When PartitionForReducedLatency is false, FrequencyResponse must be a row vector. The FFT length is equal to the length of the FrequencyResponse vector. When PartitionForReducedLatency is true, FrequencyResponse must be a 2P-by-N matrix, where P is the partition size, and N is the number of partitions. This property applies when NumeratorDomain is set to 'Frequency'. This property applies when NumeratorDomain is set to 'Frequency' and PartitionForReducedLatency is set to false. Flag to specify if the filter coefficients are all real, specified as true or false. false –– The filter uses the traditional overlap-save or overlap-add method. The latency in this case is FFTLength – length(Numerator) + 1.
true –– In this mode, the object partitions the numerator into segments of length specified by the PartitionLength property. The filter performs overlap-save or overlap-add on each partition, and combines the partial results to form the overall output. The latency is now reduced to the partition length. FFT length, specified as a positive integer. The default value of this property, , indicates that the FFT length is equal to twice the numerator length. The FFT length must be greater than or equal to the numerator length. This property applies when you set NumeratorDomain property to 'Time' and PartitionForReducedLatency property to false. Numerator partition length, specified as a positive integer less than or equal to the length of the numerator. This property applies when you set the NumeratorDomain property to 'Time' and PartitionForReducedLatency property to true. Filter latency in samples, returned as an integer greater than 0. When PartitionForReducedLatency is false, the latency is equal to FFTLength – length(Numerator) + 1. When PartitionForReducedLatency is true, the latency is equal to the partition length. fdfOut = fdf(input) filters the input signal and outputs the filtered signal. The object filters each channel of the input signal independently over time in the frequency domain. Data input, specified as a vector or a matrix. This object supports variable-size input signals. That is, you can change the input frame size (number of rows) even after calling the algorithm. However, the number of channels (number of columns) must remain constant. Filter input signal using overlap-add and overlap-save methods, and compare the outputs to the output of a FIR filter. Design the FIR lowpass filter coefficients using the fir1 function. The sampling frequency is 8 kHz, and the cutoff frequency of the filter is 2 kHz. The impulse response has a length of 400. Create two dsp.FrequencyDomainFIRFilter objects and a dsp.FIRFilter object. Set the numerator of all the three filters to imp. Delay the FIR output by the latency of the frequency-domain filter. Create two dsp.SineWave objects. The sine waves generated have a sample rate of 8000 Hz, frame size of 256, and frequencies of 100 Hz and 3 kHz, respectively. 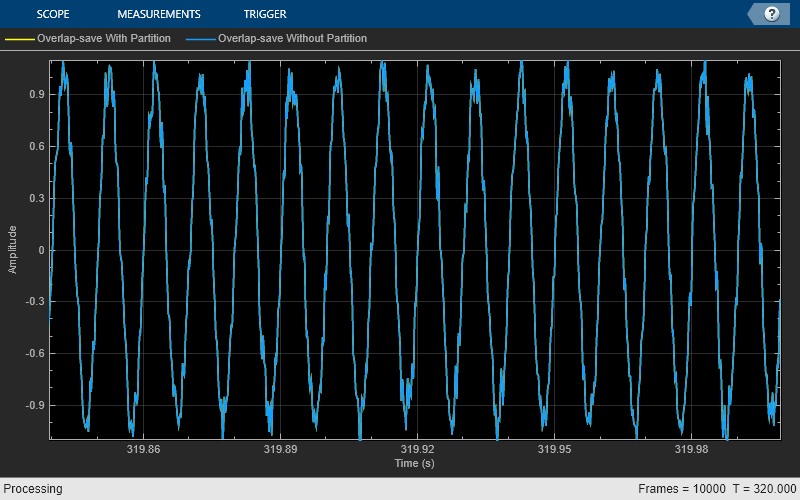 Create a dsp.TimeScope object to view the filtered outputs. Stream 1e4 frames of noisy input data. Pass this data through the frequency domain filters and the FIR filter. View the filtered outputs in the time scope. The outputs of all the three filters match exactly. Partition the impulse response length of a frequency domain FIR filter. Compare the outputs of the partitioned filter and the original filter. Design the FIR lowpass filter coefficients using the fir1 function. The sampling frequency is 8 kHz and the cutoff frequency of the filter is 2 kHz. The impulse response is of length 4000. Create a dsp.FrequencyDomainFIRFilter with coefficients set to the imp vector. The latency of this filter is given by , which is equal to 4002. By default, FFT length is equal to twice the numerator length. This makes the latency proportional to the impulse response length. Partition the impulse response to blocks of length 256. The latency after partitioning is proportional to the block length. Compare the outputs of the two frequency domain filters. The latency of fdfOS is 4002, and the latency of fdfRL is 256. To compare the two outputs, delay the input to fdfRL by 4002 - 256 samples. Create two dsp.SineWave objects. The sine waves have a sample rate of 8000 Hz, frame size of 256, and frequencies of 100 Hz and 3 kHz, respectively. Create a dsp.TimeScope object to view the filtered outputs. Stream 1e4 frames of noisy input data. Pass this data through the two frequency domain filters. View the filtered outputs in the time scope. Specify the numerator coefficients of the frequency-domain FIR filter in the frequency domain. Filter the input signal using the overlap-add method. 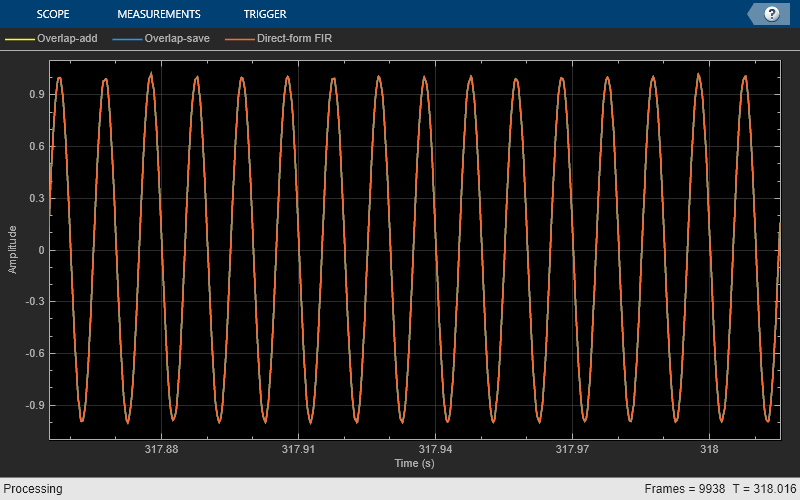 Compare the frequency-domain FIR filter output to the corresponding time-domain FIR filter output. Design the FIR lowpass filter coefficients using the fir1 function. The sampling frequency is 8 kHz, and the cutoff frequency of the filter is 2 kHz. The time-domain impulse response has a length of 400. Compute the FFT of this impulse response and specify this response as the frequency response of the frequency-domain FIR filter. Set the time-domain numerator length, specified by the NumeratorLength property, to the number of elements in the time-domain impulse response. Create a dsp.FIRFilter System object? and specify the numerator as the time-domain coefficients computed using the fir1 function, imp. Delay the FIR output by the latency of the frequency-domain FIR filter. Stream 1e4 frames of noisy input data. Pass this data through the frequency-domain FIR filter and the time-domain FIR filter. View the filtered outputs in the time scope. The outputs of both the filters match exactly. Stockham, T. G., Jr. "High Speed Convolution and Correlation." Proceedings of the 1966 Spring Joint Computer Conference, AFIPS, Vol 28, 1966, pp. 229–233.